See more objects with the tag landscape. This is a Sidewall. It was produced by The Curwen Press. It is dated 1928 and we acquired it in 1996. Its medium is lithograph from linocut. It is a part of the Wallcoverings department. Edward Bawden was a watercolorist, book illustrator, mural painter, and designer. In 1925, Bawden saw William Morris’s wallpaper, Daisy, in an exhibition and was inspired to design his first wallpaper. Bawden's early wallpaper designs were hand printed by linoleum block. Harold Curwen, of the Curwen Press, saw some of these early designs and wanted to transfer the pieces to his lithographic press so they could be reproduced and sold. The lithographic printing copied all the nuances of the linoleum prints but could only print on sheets of paper, not in rolls. 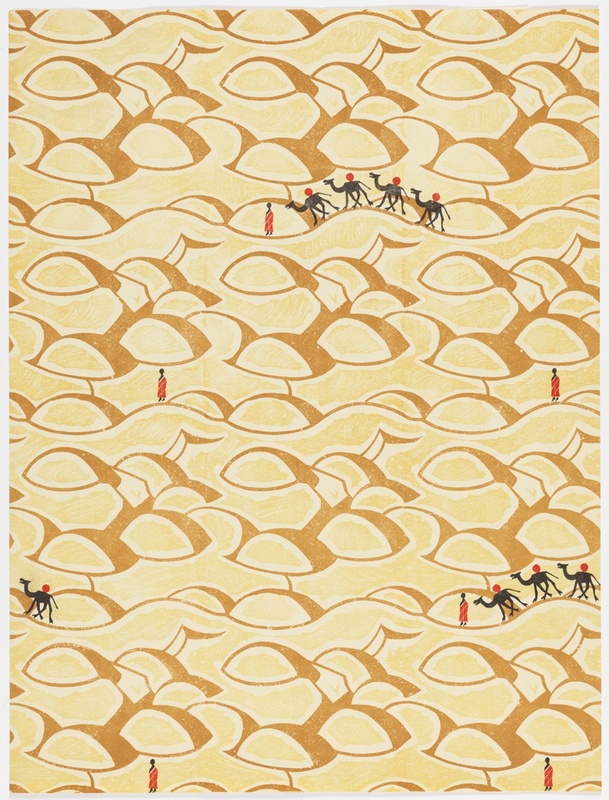 Bawden designed 14 wallpapers between 1926 and 1933 for the Curwen Press.